New York University said last Thursday that it would offer free tuition to its current and future medical students. NYU hopes that this move will help with the shortage of doctors in the US and encourage more students to go into primary care. Many physicians voiced their scepticism about this goal via Twitter, claiming that free tuition alone won’t alleviate the financial barriers of pursuing a career in medicine. New York University made a bold move on Thursday when it said it would offer free tuition to current and future medical students. The university hopes this will alleviate the financial barriers that discourage many promising high school and college students from considering a career in medicine due to concerns with high medical school costs. Ideally, without looming medical student debt, students will choose to go into less high-earning areas of medicine such as primary care. “Saddled with staggering student loans, many medical school graduates choose higher-paying specialties, drawing talent away from less lucrative fields like primary care, pediatrics, and obstetrics and gynecology,” NYU said in a news release. There’s been a shortage of primary care physicians in the US, in part because of how much less they’re paid compared to doctors in more specialised areas of medicine. The funding will draw from the university’s $US600 million endowment, which it built up over the past 11 years for this very purpose. While the new plan waives tuitionm, which is around $US55,000 annually per student at NYU, it doesn’t cover room and board or fees, which together are an additional $US27,000, on average. But many doctors are sceptical that the free ride will lead to more medical students opting into primary care. On Twitter, they argued that just covering the tuition alone, won’t be enough. Many experts believe that without altering the selective medical school application process or finding a way to incentivise students to go into lower-paid specialties like primary care in underserved or poor regions, not much will change in the field. 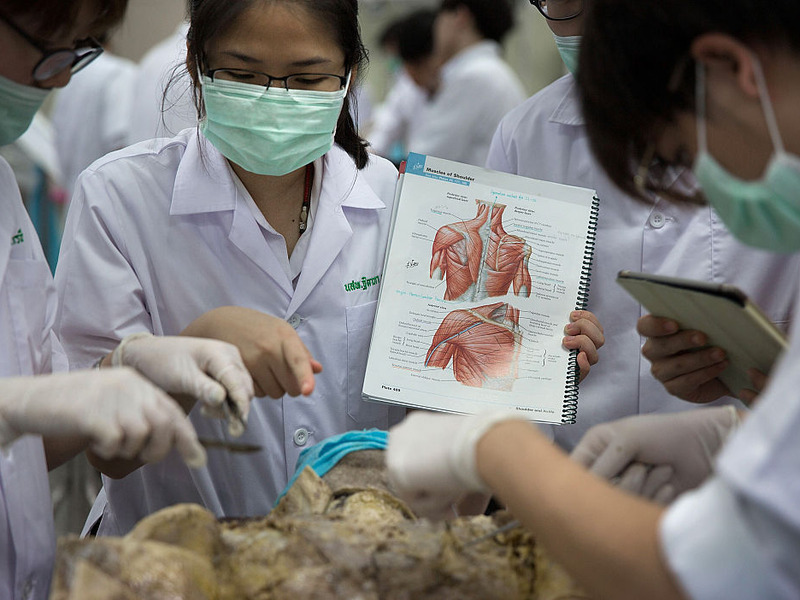 Even with the tuition break, students are still more likely to choose the option to go into more lucrative specialties like plastic surgery or cardiology. I keep hearing NYU is promoting diversity from low-income students that will go into primary care. “If six-figure debt were enough to motivate, I’d be surprised,” Mark Friedberg, senior physician policy researcher at the RAND Corporation told Business Insider. That’s because of the pay gap in lifetime earnings between primary care doctors and doctors that go into specialties. Over a lifetime, primary care doctors can make as much as $US3 million less than their counterparts in other specialties, Friedberg said. According to a 2018 report by the Association of American Medical Colleges, there will be a shortage of anywhere from 42,600 to 121,300 doctors by 2030. This is due in some part to the potential for staggering medical school debt that discourages some students from pursuing medicine. Several of the nation’s top medical schools, in response, already offer scholarships that cover some or all of the costs of attendance based on either need or merit. UCLA’s David Geffen School of Medicine, for example, has a $US100 million fund that pays for the entire cost of medical school for all four years, including tuition, fees, books and living expenses for its high-merit students, which are approximately 20% of those enrolled. The Cleveland Clinic’s Lerner College of Medicine in 2008 announced that it would cover tuition for all students admitted to their highly selective five year program, with one required research year tacked on at the end of the medical education. The class size for this program is capped at 32 students. Other programs cover tuition – with a catch. The National Institutes of Health‘s Medical Scientists Training Program (MSTP) covers the cost of attendance for 970 students across 49 schools, but students have to dedicate on average eight continuous years to get a MD and PhD, which means their medical education will be extremely research-oriented. And students completing the Health Professions Scholarship Program (HPSP) or the Uniformed Services University of the Health Sciences (USUHS) can have their tuition waived on the condition of military service. With a focus on motivating doctors to get into primary care, the National Health Service Corps covers tuition for students who agree to work for four to six years in an under-served area. These areas – geographic or population-based – tend to have shortages of primary care doctors. Additionally, in-state tuition for many public medical schools in states like Texas are becoming affordable, costing around $US15,000-$US20,000 a year. Sceptics of NYU’s free tuition plan say it glosses over other issues that are creating a physician shortage. One is the increasing difficulty of getting into medical school. From 2006 to 2016, the volume of medical school applicants has increased by 36%, but acceptance rates have either steadily decreased or stayed the same. This means medical programs are becoming increasingly selective about who they admit. NYU’s average GPA and MCAT scores for its current first year class are both in the 99th percentile. NYU’s current freshman class is 93 students (with an additional 9 from the MSTP), a decrease from the class sizes of previous years, which were in the 120-130 range. According to the Association of American Medical Colleges, in 2017, of the 51,680 applicants who applied to medical schools, only 21,338 students matriculated. That means from the total populations of students who wanted to become doctors post-undergraduate, only 41% make it to medical school. And even before pre-med students step into the doors of a medical school, there are a lot of costs. The MCATs, standardised medical school admission tests, costs $US315 dollars to take and is a gruelling seven hours long. The application fee for each medical school is around $US100, and on average, each student applies to about 16 schools each application cycle. That’s about a $US2,000 investment up front. And not every applicant is successful. After medical school, each student is matched to a residency program, where they will spend another four years at, and more if they choose to specialize. During residency, students make around $US40,000-$US60,000 a year, mostly to cover living expenses. It remains to be seen whether current NYU students alter their career paths and disproportionately get into lower-paying areas like primary care and pediatrics. And even if they do, Friedberg said, it might not do much if those doctors decide to practice in areas of the country that don’t have a shortage.